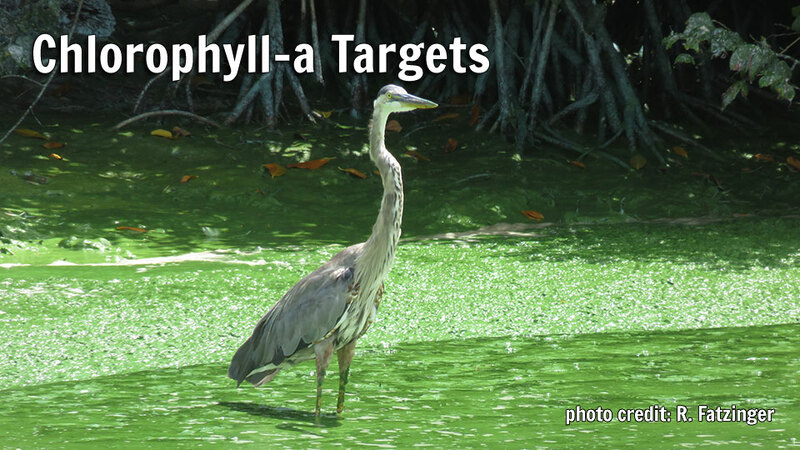 Targets created by the EPA and SJRWMD were considered for the Mosquito Lagoon (ML), Banana River (BRL), North IRL (NIRL), and Central IRL (CIRL) while the EPA and SFWMD targets were considered for the South IRL (SIRL). After a comparison of the criteria from each source, it was decided that a combination of the established targets would be used in the Indian River Lagoon Ecological Health Assessment (bolded data in Table). The SJRWMD annual median target was chosen because geometric means (EPA recommended target) were typically less protective of the Lagoon than the District’s median targets. For the CIRL, the SJRWMD annual median targets specific to the north and southern regions were selected (Steward, Lasi, and Phlips, 2010). Finally for the SIRL, the SFWMD’s conservative criteria of annual median was used as target for all three sublagoon areas.